Presenting processes and algorithms is tough. Getting your audience to understand your message and be interested in what you have to say is only part of the struggle. By utilizing creative icons and graphics you can take some of the pressure off. 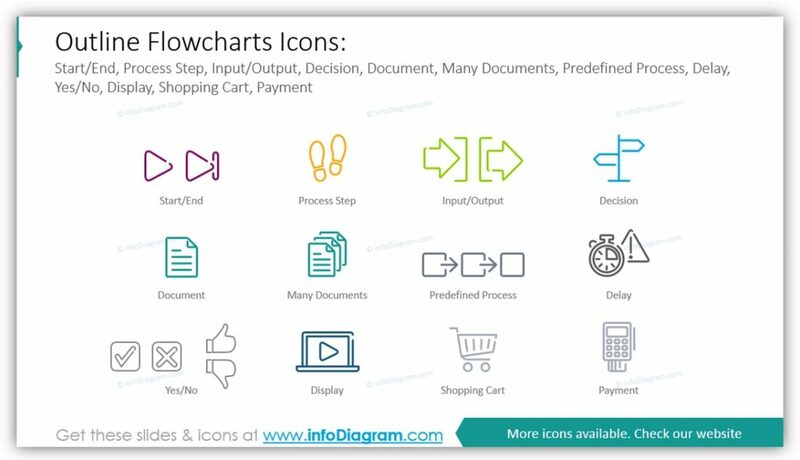 By adding editable flowcharts you can explain how particular informatics algorithms work, how decision processes should function, visualize your ordering process, show the journey of your website visitors, or highlight the flow of any business or document processes you need to explain. 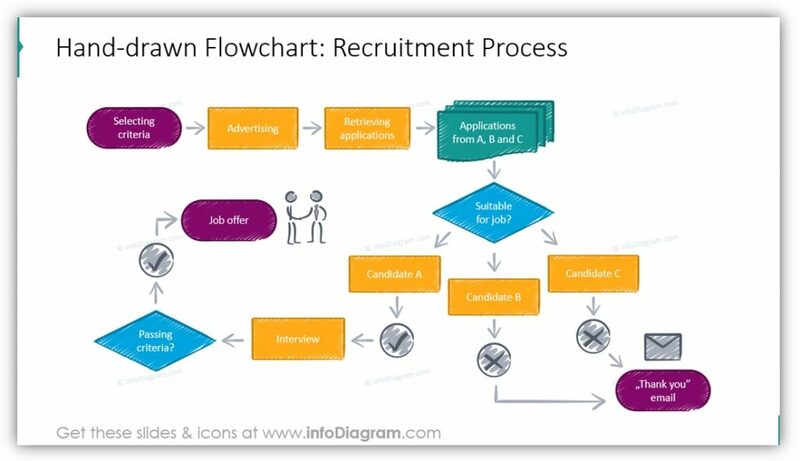 Flow charts have defined start and end status nodes and provide specific diagram shapes which are connected by arrows, so they can be applied to numerous applications. 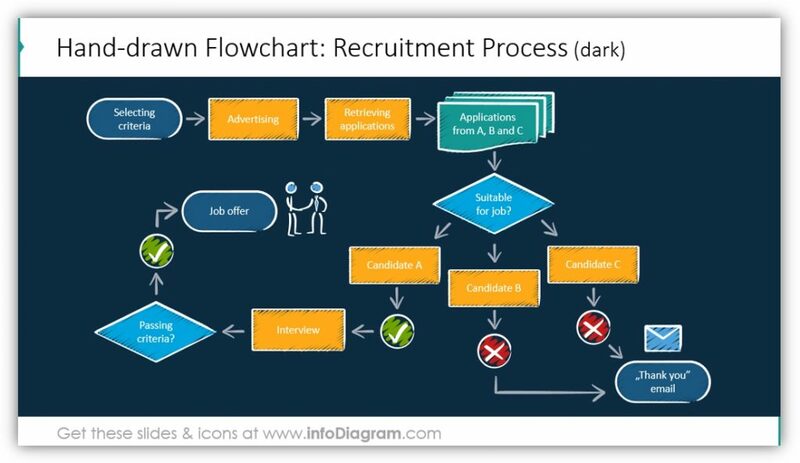 Flow charts are great because in addition to their flexibility they help show a continuous process in a clear, professional way without compromising your own personal touch. Note: All example slides below are accessible in Creative Process Flow Chart PPT Diagrams (see details by clicking the pictures). You can tailor your images to your audience, your message, your brand, or the topic by choosing the style which is most appropriate. Flat style graphics are universal and fit all styles, especially after you have customized the colors and icons used. The outline graphics are light and modern. They will resonate with tech-savvy audiences. Hand drawn, scribble icons are unique and more personal and are great for creative projects or creative audiences. Both outline and hand drawn icons can also be customized to match your project or brand color palettes. 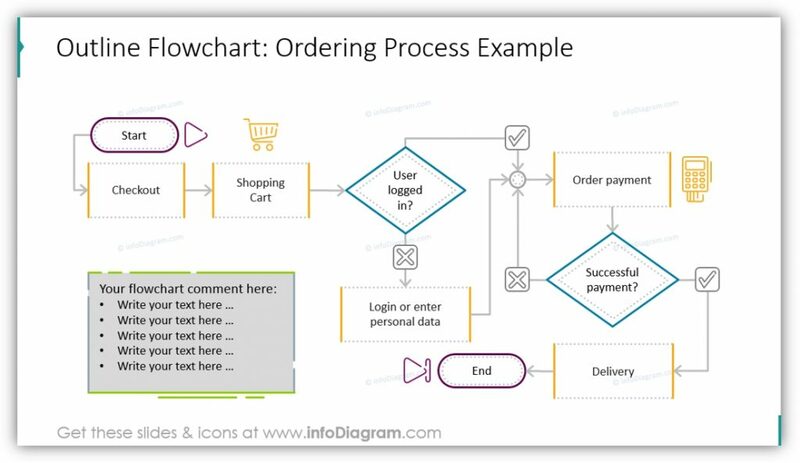 If you need to explain a complex process, like what happens when a user logs in on your website or how customers place an order, you can do so easily with a flow chart. Using a diagram like this, you can show your audience in an easy-to-follow way what the options are at every stage. Flow charts aren’t only for IT and technical processes. You can use them to explain logistics or, as in this case, your recruitment process. Customize the colors to match your brand, and decide whether a light or dark background is right for you and your audience. 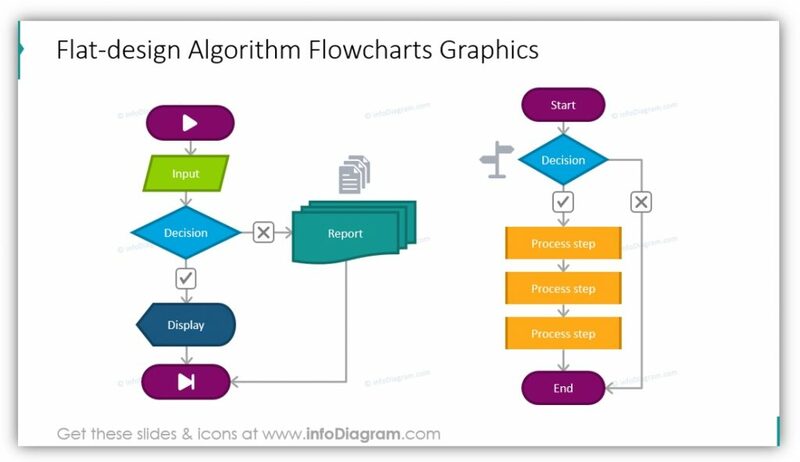 You can also showcase how algorithms work using flow charts. You can highlight the numerous paths using icons, text labels, and more. Symbols and symbolism can be incredibly helpful when explaining complex ideas or unfamiliar processes. 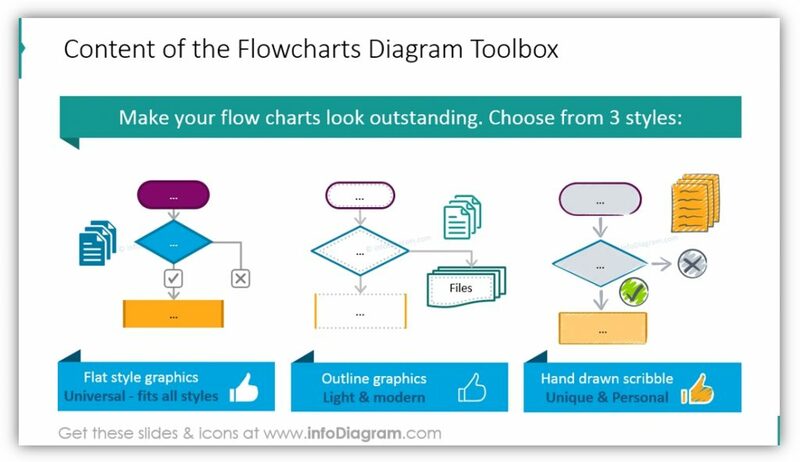 Flow chart icons can be customized to match any color scheme, be resized, or otherwise modified to suit your needs. Explain login and shopping processes or algorithms simply using flow charts and customize their appearance by selecting the appropriate style for your audience and modifying them. 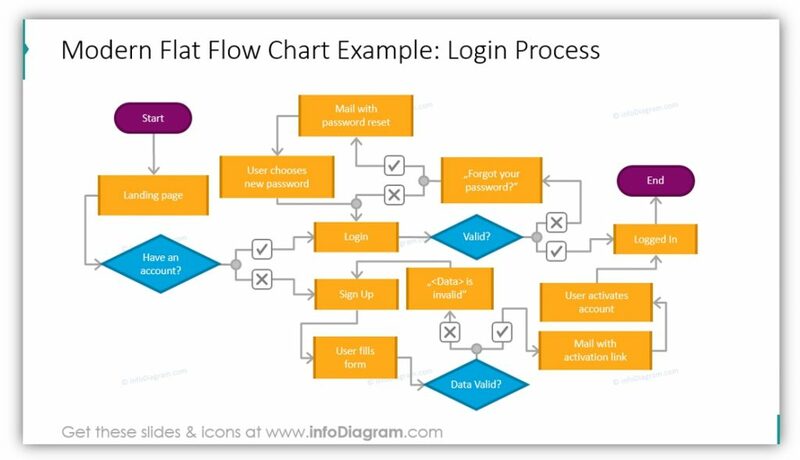 You can also explain non-technical processes using flow chart icons. You may customize any of these diagrams using supplementary icons. 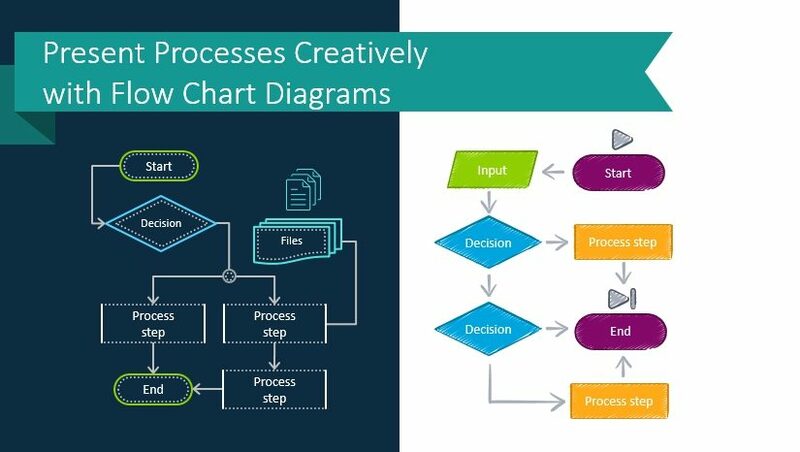 The image set can help by allowing you to create your own customized flow charts to suit your process, algorithm or timeline. You may edit the icons by changing the filling and outline colors and by deciding whether you’d like your slides to feature a light or dark background. Whatever you decide you would like your flow chart to look like, it will help your audience understand and retain the information you’re sharing with them.